We offer two courses for autistic adults to help them develop skills for social situations and everyday living and increase their confidence. 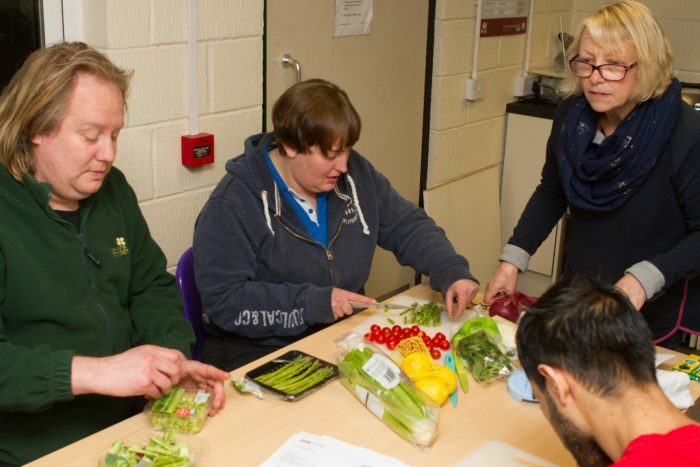 These free workshops are for adults on the autism spectrum, to help them learn basic everyday skills needed for an independent life and to develop confidence. The course is made up of weekly workshops, running over eight weeks in the evening. Each week participants will also prepare, cook and share a meal together. The weekly sessions, which last for two hours, are held at Braywick Heath Nurseries, 41 Braywick Road, Maidenhead, SL6 1DX. Details of forthcoming courses will be posted on this page. These courses are funded by Slough Borough Council and the Royal Borough of Windsor and Maidenhead’s Adult & Community Learning Fund. Participants must be aged 19+ and be residents of the one of the two boroughs. This free course for adults on the autism spectrum helps them to develop social skills and understanding. SocialEyes was developed by the National Autistic Society in conjunction with people with autism and Asperger syndrome and leading professionals in the field. SocialEyes does not ask people on the autism spectrum to change ‘inappropriate’ social behaviour or to acquire social skills by copying the ‘typical’ behaviour of others. Instead, it gives people the option of learning social interaction skills or alternative social strategies. It focuses on eight social skills that people on the autism spectrum can have difficulty with, including starting and ending a conversation, body language and facial expressions, eye contact and personal space. The course is made up of weekly two-hour workshops. SocialEyes courses held in Reading are funded by the borough council, and are for participants aged 18 and above who are residents of the town. Courses take place at the New Directions Centre at 330 Northumberland Avenue, Whitley, RG2 8DH. Courses funded by Slough Borough Council and the Royal Borough of Windsor and Maidenhead’s Community Learning Fund are held at Berkshire College’s campus in Langley, near Slough. Participants must be aged 19+ and be residents of the one of the two boroughs. This free course helps autistic adults aged 18+ to safely navigate the online world and to respect other people they communicate with digitally. The course, taking place at Braywick Heath Nurseries in Maidenhead, consists of two two-hour sessions, running over consecutive weeks, with separate groups for men and women. They will look at online security issues, including the need to use strong passwords and sharing personal information on social media; interpreting things other people have written, inappropriate social media posts; cyberbullying and its impact on others; and how people can protect themselves online if they receive unwanted attention and where to go for help. It will also look at the positive side of the online world, including tools and software to enhance users’ experiences. Sessions will be tailored to meet individual or group needs. These courses are for autistic adults aged 18+ who are residents of the Royal Borough of Windsor & Maidenhead and the Borough of Slough. They are funded by the two councils’ joint Adult & Community Learning Fund.